"I imagine a photocopy would be quicker"
Mr Monkey scampered into the Breathe residency space to see Pei Yuan Jiang's Whisper residency (a shorter version of a Breathe residency). 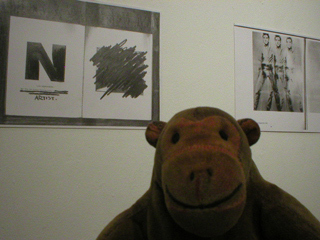 Mr Monkey thought that there were photocopies on the walls, but he realised that they were actually very careful pencil drawings of photocopies of pages from art books. This is all because Pei is interested in the line between an original work and reproductions of it, which are more often seen*. You can read about Pei Yuan Jiang at the Chinese Arts Centre website. 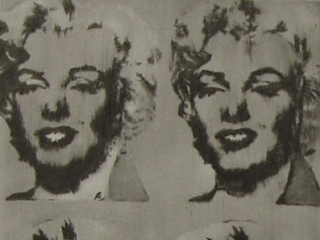 * Mr Monkey would like to draw your attention to the fact that the Marilyn Monroe you can see in the second picture is a web browser's reproduction of a digital image of a drawing of a photocopy of a printed reproduction of a photograph of a screenprint of a photograph of Marilyn Monroe. 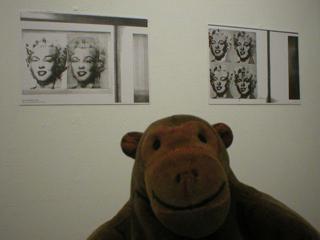 Mr Monkey thinks that enough lines between original and reproduction have been crossed for anyone.